A few days away for me, means spending some wizard time with my son, eating great food, oh and I must not forget my husband. I get to actually see him! Cornwall is the part of our luscious country that I love the most. My Pa lives down here and we frequent his house as many times a year as we can. Its a totally tiny house but who cares when the sea gulls are screeching and the waves are crashing. This week has proved to be perfect. My dad is not around so we are able to spread out amongst the two bedrooms -Harley normally has to have his bottom half on a futon underneath our bed as the bedroom is so small! - and get around the dining room table with ease. 4 nights is not really long enough but to be here is heaven. We planned to go to a fantastic bar on the beach in Porthtowen near Hayle/ St Agnes blue-bar and on the morning of the said day, John awoke with a migraine. Completely unprepared for this event , I zoomed off to St Austell - or St Awful as it was know as when I lived here! - with Harley in tow to get some form of cure. We ended up in our favourite shop, Planet Lifestyle, a surf clothes shop and the only saving grace of this dated town. Pain killers by the wayside we left with beads and flipflops for Harley and an ace shirt for the invalid. But worst of all the plans of eating in Blue were forgotten. Well fortunately upon return, John was partially better and the tablets made our trip viable. So the beach was fantastic, calm green sea, the sand was too hot to walk on and our lunch was beautiful. What a refreshing chance that Harley could have a mezze with vine leaves, hummous and couscous salad. I have local moules marinieres a la creme, thatchers cider and a green salad and john, a spicy bean burger. Quite delicious looking out to sea. 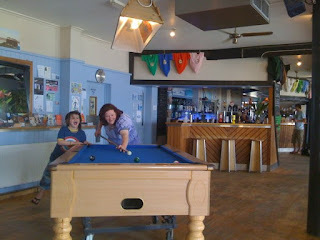 Harley and myself then had a game of pool. Ever taught a 6 year old to do that???!! It was very exciting until I potted the black at the last moment! Well, how do you top all of that?